Does this still allow one to e.g. turn off the laptop display entirely when plugged into an external display (my brain can’t deal with multiple displays)? The laptop display can be turned off by closing the laptop lid or by using the shortcut keys on the keyboard. I have two monitors on my desktop, but I only enable the secondary one when I have a specific task to do. This helps me maintain focus and keeps my programs behaving the way I like/expect. The current display settings has an on/off toggle to facilitate this use case, I think it would be an error to remove it. Please keep the option to turn off the laptop display when plugged in to an external monitor. I keep my laptop lid open so I can suspend easily by pressing the power button. It rather not have to close and open the lid each time I would like to suspend or wake the laptop. I’d love to see it remember my settings according to attached monitors (basically, if I dock at my desk, use the 2-monitor config, if I unplug the laptop switch to the internal-display-only config). Right now I have to open display settings whenever I unplug the external monitor. The display settings for different configurations should be stored and reapplied when the configuration changes. Does xrandr report the display as disconnected after you undock? Will these settings be applied in GDM too? I have a laptop with a broken screen and in GDM it is the default screen (even though I’ve turned it off in Display Settings). This makes it a bit cumbersome for me to log in sometimes. Oh forgot. Awesome work on this! What about frequency selection ? Will it now remember the monitor when the screensaver kicks in? That turns on power settings, which sleeps the external monitor. Result: all windows are on the laptop screen when the screensaver is done. A monitor in sleep mode should certainly not cause it to be removed from the configuration. Could you file a bug report in bugzilla with more details? Would it be possible to also allow selecting the refresh frequency ? it is needed to be able to use the desktop on some specific video hardware, such as HDMI->SDI converters. Perhaps you could add your comment to https://bugzilla.gnome.org/show_bug.cgi?id=655041 ? In this new settings panel is it possible to select which graphics card is connected to the display ? Hybrid laptops are very common nowadays and there is no real easy way to deal with that. Worse is that fedora uses the most power-consuming graphics adapter by default draining battery. It’s not possible at the moment, but we can certainly ask Allan if he could look into this. 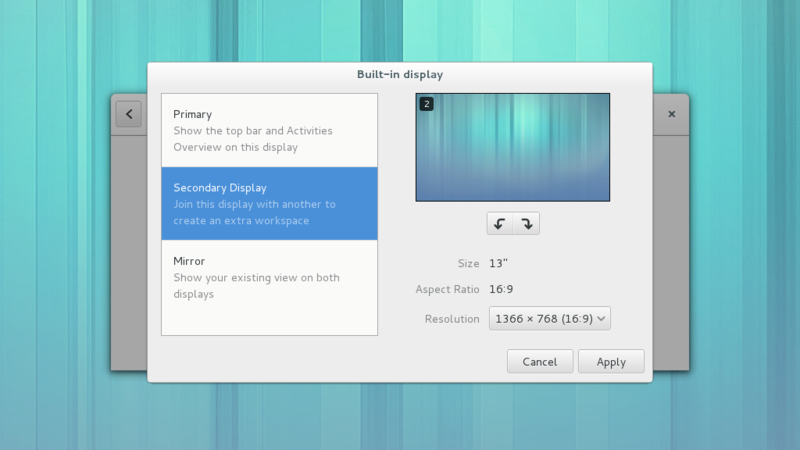 Just about all modern radeons support 4-6 displays, so please make sure you can easily accomodate more than 2. Also, I would echo the request to be able to turn off the laptop display from within the monitor applet without having to close the lid. 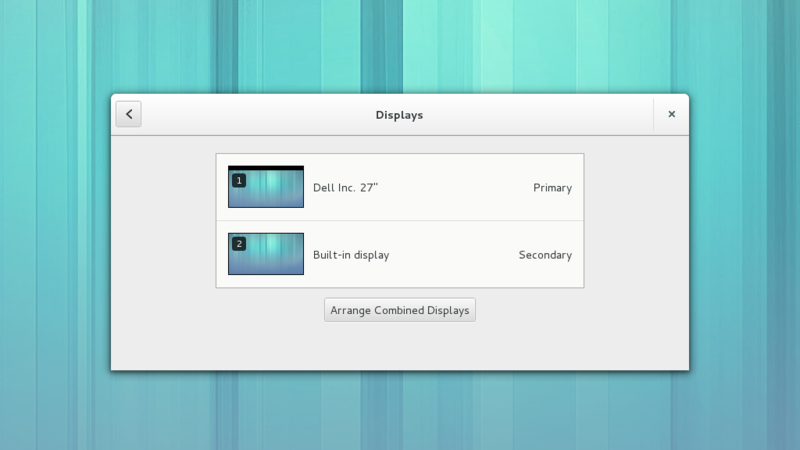 There should be no problem supporting more than two displays. You can also turn the laptop display off using the shortcut keys on the keyboard. 2) or more fun, in intel ivb, you can drive 3 displays but with constraint that two of them must be same connector type (ie. DP1 and DP2), and the same resolution and refresh rate. At the kernel (drm/kms) level, we plan to deal with this with atomic modeset. Ie. give the kernel an API, where it can request multiple outputs to be configured simulatenously. Or rejected if the combination cannot work together. There will be a “dry-run” flag, so userspace has a way to check whether a combination of modes is possible or not. Up at userspace, xrandr will need a similar proto update, to expose the same sort of API to the client. Anyways, as long as you are re-designing the UI, you probably want to consider these crazy sort of cases.